It is easy to frame conservation as a clash between environmentalists and polluters. But this view can greatly oversimplify many complex choices. What does conservation look like when ideas about nature cut across political lines? In my book, Chemical Lands: Pesticides, Aerial Spraying and Health in North America’s Grasslands since 1945, I explore how pilots, scientists and farmers developed practices for “cropdusting” on the Great Plains after World War II. This industry took shape years before Rachel Carson published Silent Spring, a sweeping critique of widespread use of synthetic pesticides, in 1962. Chemical companies made broad promises about these “miracle” products, with little discussion of risks. But pilots and scientists took a much more cautious approach. Well before a national environmental movement emerged, local producers developed their own ways to study safety and health questions as early as the 1950s. If protecting agricultural health here meant using pesticides to meet production goals, they wanted to understand the risks too. After World War II, U.S. farmers began using new chemicals, many developed during the war, to fight pests. Grasslands weeds like musk thistle and field bindweed, and insects like corn borers, threatened production lands as markets were expanding during the postwar economic boom. 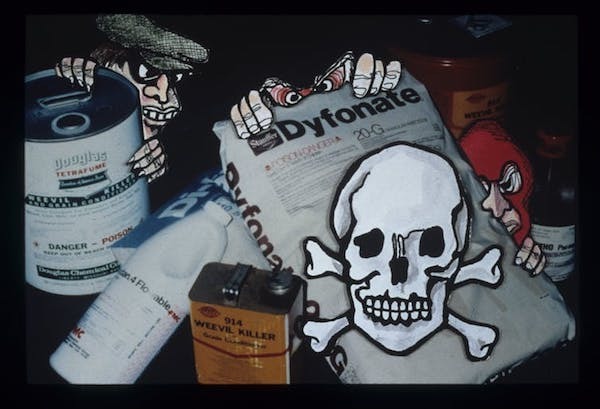 Farm poisons seemed like a “silver bullet” response. Just as insecticides like DDT had protected Allied soldiers against diseases such as typhus fever, they could protect fields at home, companies like DuPont and Dow told farmers in advertisements, trade journals and in-person sales. But cropdusting pilots, known as “ag pilots,” and land-grant agricultural scientists didn’t all buy this message. They worried that using pesticides might be just as dangerous as not using them. In search of answers, they attended annual conferences held at universities and rural convention centers. At meetings like the North Central Weed Control Conference, which took place annually starting in 1944, ag pilots and farmers could learn about new advances and debate current practices. Records of these meetings show a kind of “chemical stewardship” developing on the Plains. We all know that it will take years of research, education, regulation, manufacture, distribution of materials, and plain good farming in a sound agriculture and industry before the weeds that are now present can be most efficiently and economically brought under control. Little progress can be made until the biological foundations … are better known. These chemicals compare with some of the new miracle drugs in medicine. They have the power for tremendous good, but they also have the power for great harm if improperly used. … With this information as background you can see that many persons are deeply concerned over the possibilities of this thing getting out of hand. 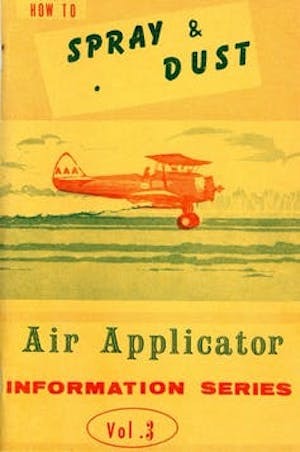 In Hays, Kansas, pilot Donald E. Pratt—known as the “Spray King of the West”—established the P-T Air Service, an aerial spraying school that combined spraying education with agricultural science. Pratt had his pilots learn as much as they could about the newest pest control chemicals on the market. His crew met with state entomologists and weed scientists to better understand crop-pest interactions. Then Pratt conducted his own experiments on private test plots to assess effectiveness and hazards. Many Great Plains pilots ran flight schools similar to Pratt’s. Nonetheless, some operators cut corners. Renegade pilots failed to pay attention to wind direction for target fields. In my archival research, I found that their haphazardness resulted in many chemical poisonings in fields and communities. Some suppliers developed a process called “incorporating”—mixing two or three different pesticides together, then repackaging the adulterated poison and mislabeling it as an entirely different chemical. These products either over-poisoned farmers’ fields or had virtually no effect on pests. They also threatened ag pilots’ professional reputations. But reputable weed scientists and ag pilots continued studying risks of aerial pesticide application. They also devised methods to stop chemical hucksters, such as designing industry certification documents and supporting aerial spraying laws. Although today’s poisons are more dangerous than any known before, they have amazingly become something to be showered down indiscriminately from the skies. Not only the target insect or plant, but anything human and nonhuman within range of the chemical fallout has known the sinister touch of the poison. For Carson, health encompassed humans, wildlife and the environment in a holistic way. She implicated producers and the chemicals they used in endangering all living things. Farmers, ranchers, cattle, crops, water supplies and cities were all at risk. Silent Springsparked calls for regulation in the 1960s and 1970s, culminating in the creation of the Environmental Protection Agency in 1970 and the banning of DDT in 1972. Many ag pilots pushed back, claiming they had already developed practical methods to minimize risks. Pesticides were dangerous, but so were pests. Protection and safety on farmlands meant “safe,” “standardized” agricultural chemical use. After DDT was banned, new and more toxic alternatives succeeded it—first organophosphates, and more recently, neonicotinoids. But insect pests and weeds have developed resistance to each new generation of products. Today many farmers are contending with weeds that have developed resistance to the widely used herbicide glyphosate—the latest step on this chemical-pest treadmill. Farm chemicals remain a key part of conventional agriculture, and aerial spraying is still a central practice for most large-scale farms on the Great Plains. Many pilots and farmers still pursue chemical stewardship, using GPS technologies to apply pesticides precisely and use no more than needed. But as cheap chemical solutions lose their potency, agricultural extension programs increasingly are recommending approaches that include non-chemical tactics, like crop diversity and planting practices that inhibit weed growth. 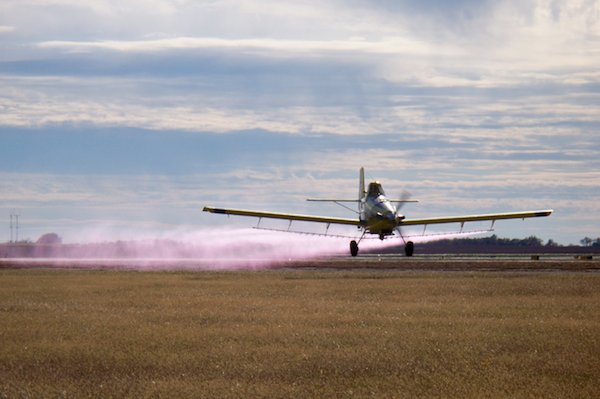 These seemingly contrasting views—using chemicals to control pests while seeking to minimize environmental damage—reflect the nuanced attitudes many Great Plains farmers and pilots have long held toward pesticides and herbicides. David Vail is an assistant professor of history at University of Nebraska Kearney. He grew up in Southern Oregon's Rogue Valley and spent much of his youth exploring the state's mountains and wilderness areas. He holds a BA from Southern Oregon University, an MA from Utah State University, and a PhD from Kansas State University.